Today’s guest blogger is antiques collector and dealer Marianne Dow, who writes about the bottle collecting hobby for the Findlay Antique Bottle Club. You can find her on Show & Tell, too. 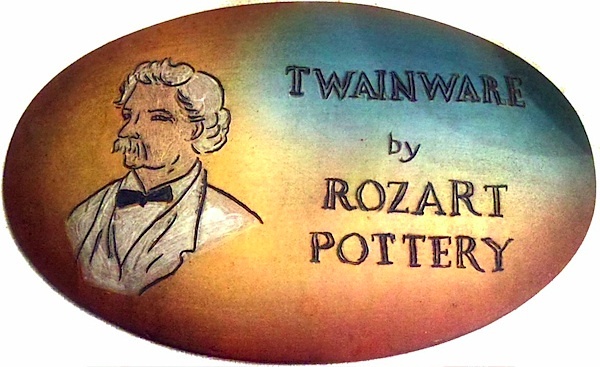 Back in 1996, I picked up this small pottery display plaque/sign advertising Rozart Pottery’s Twainware line. I love Mark Twain—and art pottery—and the fact that it was an advertising piece made it a “must-have.” I remember that I bid $30 on it, which was high for me back then, as I had finally quit my day job and moved to Ohio to be a full-time antiques dealer. I usually kept my bids pretty low, but this one was personal, and I won—yay! I keep it on my library’s literature shelf, with figurines of Mr. Twain and some of my other favorite authors. I tried to find out about the pottery, but back then the Internet didn’t have all the info that’s available now. I couldn’t find anything about it. Since the piece was for my own collection and not for sale, I tucked it into my shelf of treasures and didn’t pursue researching it. Then last fall I came across a short article about Rozart Pottery, and I thought, “A ha!” At last, I would get some answers about this mystery pottery company. Rozart pieces are in the style of famous American art potteries like Rookwood and Weller. I am sure prices for this gorgeous pottery will go steadily up as time passes. It is truly art. That seems to be the end of Rozart’s production years. We know they put out lots of beautiful vases and steins from seeing them for sale now, but I couldn’t find out anything else about those in-between years. This website shows a sketch of the Rozart incised mark that matches my display sign’s mark, and tells us that the trademark has expired. I found Rose Ryding’s living estate auction in 2009, billed as “Rozart Pottery Founder’s Estate Auction,” which took place after her husband, George, had passed away. The listing can still be viewed, with some photos of Rose’s pottery collection. There is no website for Rozart Pottery, although a Google search comes up with this link showing a Rozart Pottery Studio at 504 North Kimball, Excelsior Springs, MO 64024, with the tagline, “We specialize in handcrafted American Art Pottery.” Apparently, the company used to have a website. The mailing address shown also came up as a real estate listing at the time of my research. This just goes to show you how much more info there is online now—and yet so little, when it comes to particular topics. Timing plays an important part in research. The auction and house-for-sale info, for example, were only added in 2009. Now there is this article, for the next researcher to find. Do you know anything about Rozart Pottery Studio? Let us know! You’re into the research as deeply as I am! I’m one of the artists that worked for Rozart (my parents’ pottery business). We stopped making Rozart after my dad, George, passed away in January of 2007. We were selling pieces on the website and out of Mom’s garage, but after Dad’s death we decided to hold on to the few pieces we had left and eventually took down the website. Does anyone have information about the individual pieces made by Anne Rydings White? I have a plate I believe to have been made by her and would love to authenticate my guess. It is very different from Rozart but is signed ARW and I think the date 81. Would appreciate any help. Thanks. “ ” Until that moment, classical music had been the genre of choice for aspiring synthesizer musicians.